A photographic recap of the days events. Next time I do a fun run, I swear I’ll have a more creative costume. Race day involved a few dozen superheros (Wonder Woman was both male and female this year) and many other wonderful costumes. Of course the team that won didn’t dress up, but then again, if you can run an eight minute trail mile through those hills then you don’t need any frills. 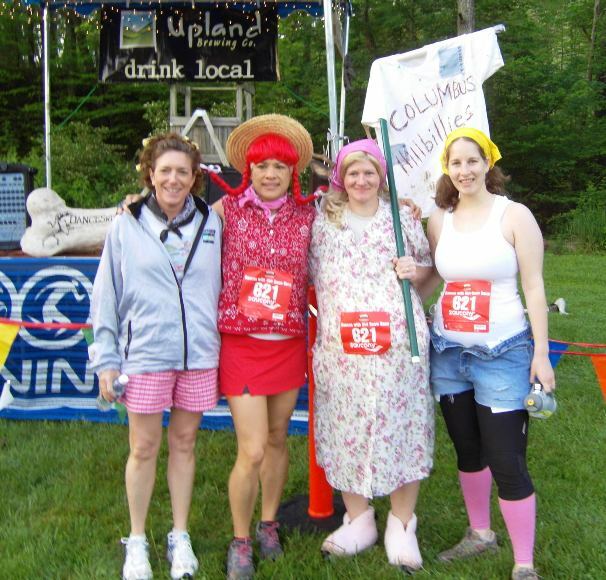 I wanna know: What costume would you sport on a fun run? And what is the greatest lesson you’ve learned from a race? At least that is what my DWD metal calls me. Yesterday I was uninjured lucky enough to participate in the 55 mile relay in Gnaw Bone Indiana. And boy was it brutal. 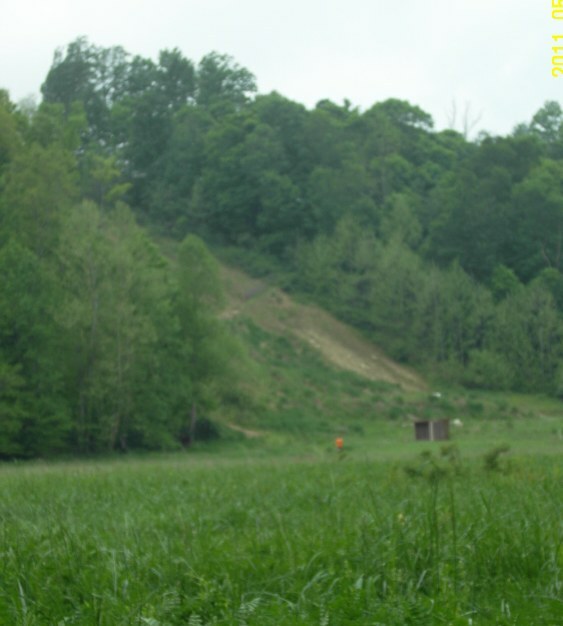 Most people consider trail running to be conducted on hiking trails that can be found at a local park. Well this was not nearly the same. Bushwhacking would be a more apt description. The one thing to remember during the race is to follow a specific ribbon color, regardless of where it may take you. Most legs set you upon a forest and you must traverse your way through untamed terrain. So much pain, so much fun. To make the day more entertaining, many teams dressed up. Our theme was Columbus Hillbillies. One of my teammates dressed as a pregnant woman, complete with slippers that fit over her running shoes. Although we put in some effort into our costumes, many of the other teams showed up in more impressive gear (and ran in it the entire day). I must admit that many of the teams were politically incorrect, but everyone was a great sport. My favorite was a group of Hashers from Michigan. The hash, a drinking club with a running problem, was well represented this year. 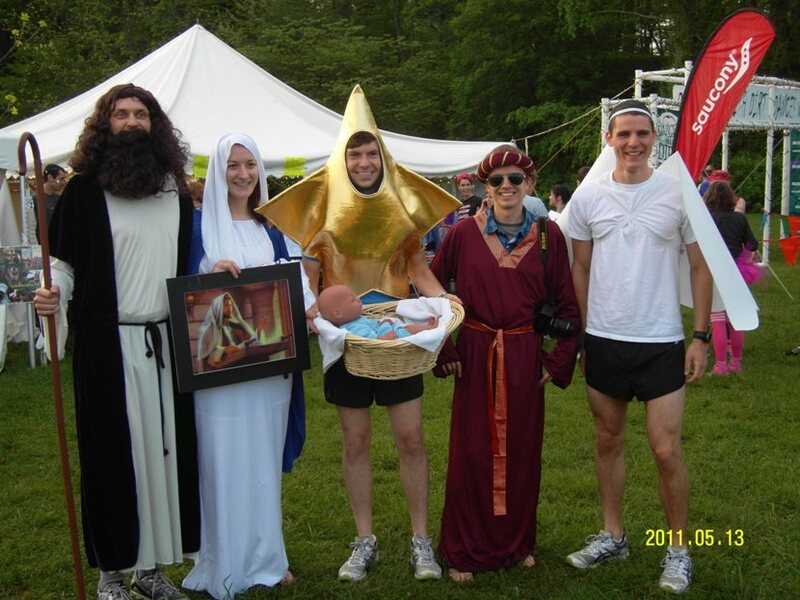 These folk dressed as biblical characters, each leg the runner carried baby Jesus and at the exchange they sang songs. Quite a lively, lovely group. 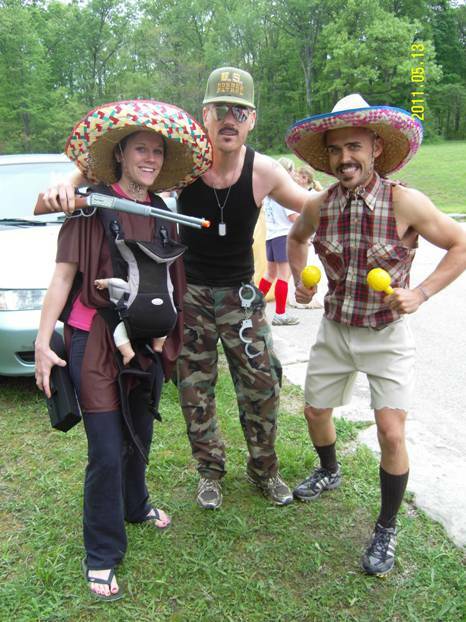 Last year’s costume winners were in attendance as the Border Patrol. There were women in prom dresses and others in hula skirts with coconut bras (yes, one girl ran in just a coconut bra, it looked darn uncomfortable). Somehow I was designated as the first runner, this meant tackling a terrifying hill in my first half mile. The photo does not do it justice. First I was required to climb up the side of this slope before running two miles and plummeting down. I’m proud to say I didn’t fall or roll down the hill (although rolling might have been faster). Climbing was a constant theme throughout my legs; over downed trees, up sides of mountains, and finally up a few hundred stairs in the pouring rain. Nothing I’ve trained on in Ohio can be compared to the terrain I encountered yesterday. I suppose that was part of the appeal? I’ll post more details of race day when I can muster the energy to chronicle the days events. As for now, I’m going to put my feet up, relax, and get some of the dirt out from beneath my nails. 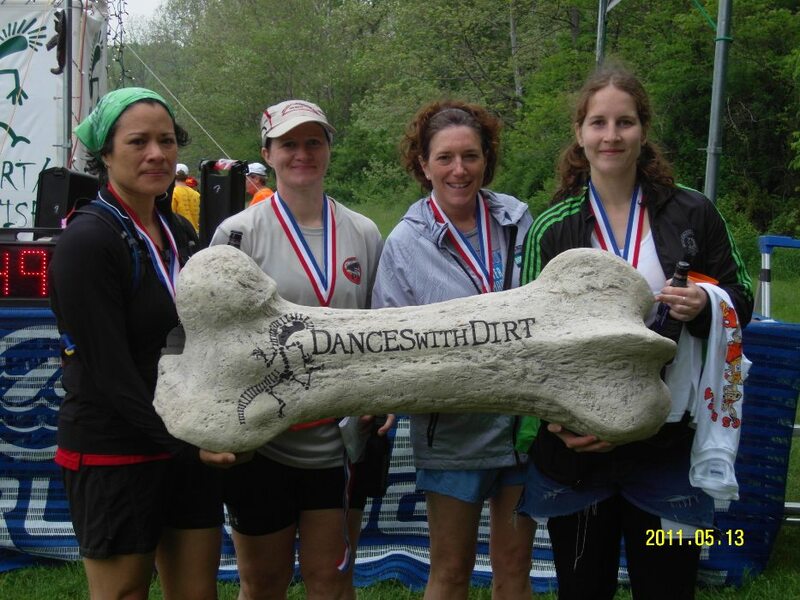 This will be the second year I take on the 55 mile relay at Dances with Dirt. Last year I was a proud member of RHINO (Running Hard in Near Ohio or Run Harder It’s Not Over, however you choose to look at it). There were three fearless females and two manly men on my team, unfortunately two of us gals managed to get lost and injured along the way. This race was the first time I incurred an ankle injury, maybe I should have taken heed after that one… (hindsight is 20/20, right?) Just wait to see what precautions I take this year, I’ll be much better prepared! As this race approaches, I look forward to all the ups, downs, and mud pits I will encounter along the path. 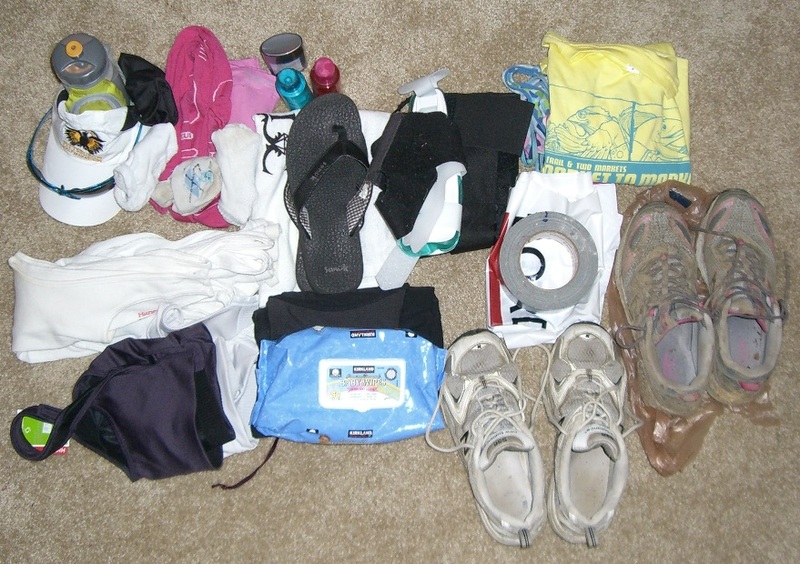 I was given the simple route last year, running the shortest and flattest of legs. And this year, well this year I get the hillier portions. My first leg, “The Plunge” involves climbing several hundred feet before plunging down a bit of a blue square and then a black diamond. I love to ski on the harder hills, but running down it? Now that will be a challenge! To top it off, one of our team members just informed us that she will be unable to attend. This means one (crazy) teammate will be running 21 miles and I will get four legs instead of three, yay? Course: Did we mention tough? You must cheat when instructed to! Exchange is made by having physical contact with the next runner in the exchange zone, while people are watching… Yikes! Can’t wait to run with my fantastic team of ladies. Did I mention our team name is the Columbus Hillbillies? Oh yes, we will dress accordingly, prepare yourself for a fantastically embarrassing photo montage. Your turn: What is the craziest race you’ve ever completed? Or what is your dream muddy, hilly, intense race?